This structure is somewhat of a mystery to me. It sits at the bottom of one side of a man-made hill. There’s a road at the top of the hill. There’s a 24″ pipe inside that allows the marsh (to the lower left) to drain under the hill and downstream (to the lower right). I’ve walked past this thing a bunch of times on walks, driven past it a bunch more times. Every time I do I wonder what the heck the thing is for. I get that drainage is important, but why this structure? Why not just a pipe with a small concrete footer? Why the large grates on hinges? Since they’re on hinges and not locked, why the manhole cover on the top? Why the railings? The grates are too large to prevent leaves from flowing in and there would have to be a several foot rise for the water to get there anyways, at which point I think the 24″ pipe would be a bottleneck. A little fed up, I took a dozen photos of the structure (inside and out) in the hopes that someone will have some idea. Where is this structure located? It’s gotta me some sort of emergency flood control storm water overflow. But that doesn’t explain why it’s so huge. yellowjkt: I’ve seen smaller ones, perhaps half the size of a refrigerator box… but this one is still unexplained. 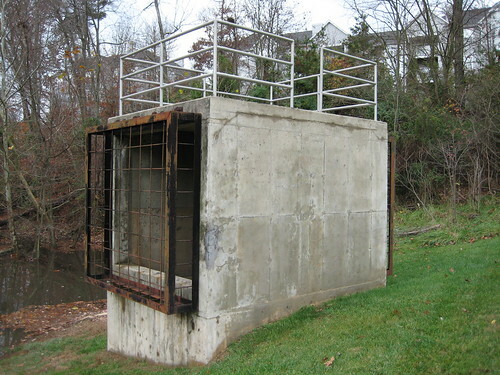 This structure is to allow the “marsh” to flood to a certain “safe” level. Once past this level water starts pouring into the structure and out the other side. Presumably “the other side” leads to some emergency runoff path. In short it prevents the marsh area from being overly flooded.